It’s no secret that our animal friends, our beloved pets of every species, provide us with companionship, love, and an overall feeling of wellbeing. They help us feel good in so many ways that we accept their value without question. In fact, all the animals of the Earth are worthy of our concern and protection and, today, need our attention more than ever. Although we’ve always known how important animals are to us, our knowing has been personal and intuitive. Now a new era of research has begun to discover the hows and whys of our bond with the animal kingdom. We know about “pet power” from our personal experience, but now science is exploring the power of human-animal connections to document and strengthen those ties! In 2015, Tufts University launched a new research wing, the Tufts Institute for Human-Animal Interaction to discover more about this important connection. The campus library was already “healing with the animals” in a program called Tufts Paws for People, bringing pets into the library during exam week to help students handle their stress and anxiety. Customer satisfaction ratings were high. Everybody loved it! Later, the university documented the positive stress-reduction results with hundreds of students participating in a survey about their stress levels before and after they spent time with the animals. When science documents the feel-good power, support grows for more research and development in this life-changing field. What Can “Pet Power” Do? 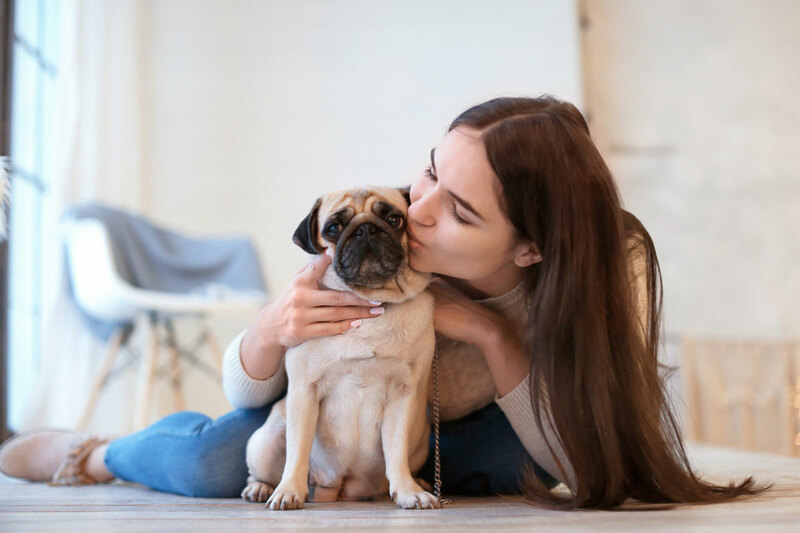 According to the American Heart Association, pet ownership is linked to a reduction in cardiovascular disease risk factors, such as lower blood pressure, lower cholesterol levels, and reduction in obesity. Research has shown that interacting with animals can increase people’s level of the hormone oxytocin, the “hug hormone,” which brings feelings of happiness and trust. Being with pets also causes your body to release serotonin, dopamine, and prolactin, more feel-good hormones. Pet your dog or cat for a few minutes and your cortisol, a stress-related hormone, will dip. Interacting with pets helps us relax, and they are pretty happy chilling with us, too! Pet ownership is often recommended for people suffering from depression, low self-esteem, and severe anxiety. Animals are role models for being present, enjoying simple pleasures, being active and awake to their surroundings. Taking your pet for a walk takes you out of your head and into the world, where they eagerly and joyfully demonstrate how to explore and appreciate the environment. Pets Bring You to Life! Dr. Marty Becker, known as “America’s Veterinarian,” has made his life’s mission advocating for the wellness benefits of the animal-human bond. “Pets bring you to life,” he says, citing the physical, social, and medical avenues of healing that pets provide. In his lifetime, he has seen the human-animal bond move from the realm of folk wisdom to the realm of scientific research. “We have to prove it is true,” he says. Science is now confirming that people who interact with pets enjoy better physical health, a stronger social connection, and a greater sense of joy and wellbeing. And, the wellness feeling is definitely mutual. What Dr. Marty Becker calls the “love loop” between humans and pets can be measured. Adoption rates increase at shelters where volunteers visit the animals to play with them and help them develop their social skills. Pet owners with chronic pain report less need for medication than people who don’t have an animal presence at home. Counselors, therapists, and teachers are drawing on the healing power of pets in their work. From veterans with PTSD to children with autism, more people everywhere are “feeling the healing” with pets! You can contribute to animal welfare by supporting your local shelter and donating to animal protection organizations. But what if you have a pet you would like to train with for animal therapy work? Look for opportunities in your community to join visitation programs that teach people and their pets how to help and heal. It could be a wonderful learning experience for you and your animal companion! If you love animals like I do, you’ll love my new course, Communicating with Pets and Animals.